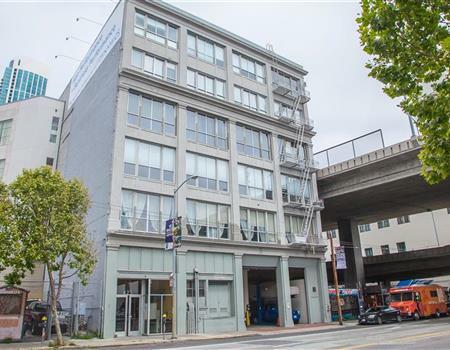 425Events is an event venue 2 blocks off South Park in vibrant SOMA. It features 17-foot high ceilings in separately rented 1,200 and 3,000 sq/ft of door-adjoined ground-floor space (80 and 250+ person capacities). We work with corporate meetings, startup presentations, coworking, private parties, gallery exhibitions, launches, mixers, and hackathons. Space details include natural light, private restrooms, dedicated conference rooms, and a kitchen. Business services include introductory pricing, technical setup, and catering. Event amenities include desks and chairs, high-speed wifi, colored-light controls, plenty of wall space, rolling whiteboards, projector, AV system and speakers, and a disability accessible lift. We are located at Harrison st / 2nd st, two blocks off South Park, and next to I-80. We are a 5-10 minute walk from the Moscone Center, the W Hotel, Caltrain, BART, the Bay Bridge, Bay Ferry, and the AT&T / SF Giants ballpark. On-street and valet parking is offered on our block.